A puppy which was seemingly left for dead has a new lease on life, as a police dog. 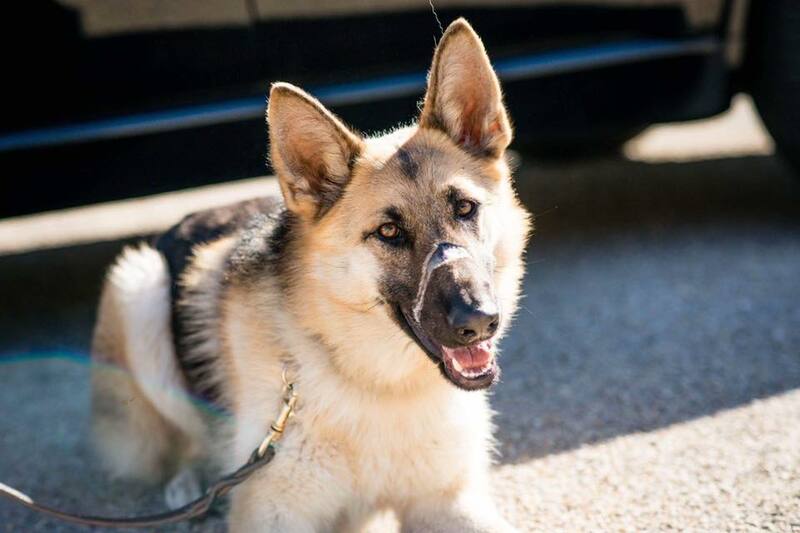 On October 7, 2018 a small, emaciated, frail German shepherd dog was brought to the Junction City-Geary County Animal Shelter. A very deep wound around her muzzle left shelter staff presuming she had been bound in some way; perhaps with rope, wire, string or a rubber band – no one could be quite sure but whatever it was left a lasting scar and constant reminder of the life she left behind, perhaps even escaped from. Shelter staff named her Nova: “…a transient astronomical event that causes the sudden appearance of a bright, apparently “new” star…” It is appropriate. 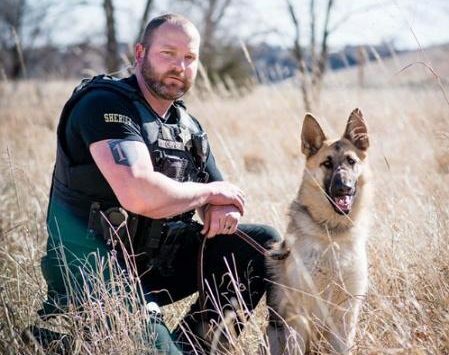 On March 19, less than 6 months after being abandoned, Nova and her scarred nose were certified in narcotics detection and tracking through the Heart of America Police Dog Association with Geary County Sheriff’s Department Lt. Justin Stopper, her handler. It’s a journey that took her less than four months to achieve. It also happened to be Stopper’s birthday. Prior to coming across Nova, Lt. Stopper, Detective Bradley Rose, and K-9 Handler Sgt. Chris Ricard, all of the Sheriff’s Department, discussed the idea of getting a second dog for drug detection and getting that dog from the shelter. “We thought we could provide a tool for the county that somebody discarded and it was at no cost to the taxpayers,” Stopper said. Even her adoption fee to cover veterinary care was paid by an anonymous donation. With Rose’s background of handling and training dogs at previous agencies and Ricard’s experience of having gone through 19 weeks of K-9 handling, the team set their sights on training and certifying a K-9 on their own. It just so happened they went to the local shelter just shortly after Nova was brought in. On average, a female German shepherd dog should weigh between 50 and 70 pounds. Nova arrived weighing less than 27 pounds and was estimated to be approximately a year old. “It’s kind of hard to eat when you have your mouth tied shut,” Ricard said with disgust. After shelter staff got Nova veterinary care, Stopper began the process of getting familiar with his new partner. “I just went and got her from the kennel and had her ride around with me to see how she was,” Stopper said, taking her back to the shelter after each outing. “For what happened to her I’m surprised. She’s never really been timid,” he added. Just before Thanksgiving, the commitment was made and Nova left the shelter for the last time but only if she passed certification. “We went through a process of evaluating her hunt drive for about a week; throwing a toy, scented bags; having her find them, Stopper said. “Then we started working on indication,” Ricard said, where she would give a trained response when she found the odor she’s trained to detect. For Nova, her indication is passive, whereby she will just sit upon detecting narcotics as opposed to scratching or barking. “I think most of it was training me. She’s going to do what she does. I had to learn how to read her and watch her,” Stopper said. Along with the scent detection, Nova certified in tracking which would allow her to be used for situations such as a lost child. The Sheriff’s Department other K-9, Scooby, handled by Ricard, is certified in narcotics and apprehension. Stopper admits he was really nervous when certification day came around; not so much about how Nova would do but if he would work well with his new partner that day. “It was very rewarding for me personally,” Stopper said of the whole experience. While Nova’s dark past will never be known, one thing seems certain; this Nova’s future seems bright. As for Gray and the staff at the shelter, they are over the moon about her success. It happens more than most people even imagine; pets being abandoned. Whether it’s getting left at the Junction City-Geary County Animal Shelter, dumped along the side of a road or simply left behind at what was once their home, it’s becoming a near-crisis issue locally. If you see someone abusing or dumping a pet – do something, call authorities.